The following list provides a sample – by no means a comprehensive list – of resources for supporting the military child. The National Military Family Association created this toolkit to give the people in military teens’ lives a way to help them manage the best and hardest parts of military life. This monograph from the Military Child Initiative identifies four important components to creating a positive, supportive school environment. This online course from the Military Child Initiative is for school administrators, support staff and teachers to help all students meet life’s challenges with resilience, focusing primarily on students from military families. This page on the Military Child Education Coalition website provides information about state school requirements and resources for 50 states, DoDEA and Washington, D.C. Topics include assessment, curriculum and state standards, graduation/promotion requirements, planning for college, and special education. This booklet, sponsored by the Educational Opportunities Directorate of the Department of Defense, is intended to help educators build coping skills in students during and after a military deployment. A 4-hour, 2-part documentary that provides audiences with an understanding of the role African Americans played in the history of the United States. Tips for parents and educators from the Military Child Education Coalition. The School Leader’s Toolkit is prepared by the Department of Defense to assist installation commanders, educators, and families involved in large-scale military relocations. Designed to help students capture critical information before each move and be aware of the cycles of emotions that can accompany each change. To order, contact Kathleen O'Beirne at kathleenobeirne@aol.com. The passports cost $4.95 + $1 postage. This website for kids covers topics for military youth, like dealing with deployment and moving to a new location, and everyday youth topics, like dealing with divorce. 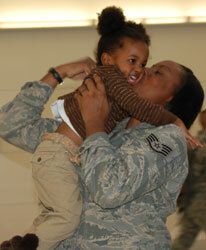 A program for military families and the school districts that serve them. It aims to address the unique challenges facing military children in our nation’s public schools, while benefiting the overall student population. An educational resource for military families, military leaders and school leaders from the The Department of Defense Education Activity’s Educational Partnership. Provides information on important policies, procedures, and best practices that are critical to supporting the needs of military families’ education. A publication designed to help educators better understand and respond to the unique issues facing military kids whose parents or loved ones have been or are currently deployed, from the Washington State Office of the Superintendent of Public Instruction. A bilingual (English and Spanish) multimedia outreach program designed to support military families with children between the ages of two and five who are experiencing deployment, multiple deployments, or a parent's return home changed due to a combat-related injury. A U.S. Department of Education guide for parents and students who are coping with the aftermath of a natural disaster, as well as teachers, coaches, school administrators and others who are helping those affected. Although the focus is on natural disasters, these tips may apply to other traumas students may experience. The primer from the Virginia Military Family Services Board looks at the four major aspects of military lifestyle: separations or deployments, homecomings, relocation, and crises. It includes an activities section designed to help children cope with the adjustments that a military lifestyle can demand. Finding My Way: A Teen's Guide to Living with a Parent Who Has Experienced Trauma - Examines the teenager's experience of having a parent who has endured trauma-ranging from military combat to domestic violence to 9/11 to natural disasters.